I'm trying to list the what various keys do inside the documentation for my CLI program, but I'm not sure what to refer to this key as. It is commonly referred to as either Enter or Return, but which is considered better UX? I was going to list it as Enter/Return, but that seems sloppy. A Google search seems to indicate that Enter is more prevalent. However, my laptop gives different results - while having both enter and return on it, return is printed in larger text on the key and is placed closer on the key to the user. How should I refer to this key? To be frank, only a selected few are aware that the Enter and Return keys are not the same - whether you refer to it as Enter or Return, users will press either buttons (if they have both buttons). This is due to the fact that on very few software products the Enter and Return keys do different things (Avid's Pro Tools is the only example I can give). My own experience is that Enter is a more popular name; "Press the return key" sounds odd, while "Press Enter" sounds natural. I fail to see anyone to whom you'll say "Press Enter" going "Hu? ", while I can imagine this happening if you'll say "Press Return". But that's just me and based on my own subjective experience; perhaps in Norway they use Return more than Enter. However, as you said, a search for "Press Enter" on Google yields 15 million results, while "Press Return" yields less than a million. If I had been you I wouldn't worry about it so much and use Enter. The term Return is a shorthand for Carriage Return. Originally, the term carriage return referred to a mechanism or lever on a typewriter. It was used after typing a line of text and caused the assembly holding the paper (the carriage) to return to the right so that the machine was ready to type again on the left-hand side of the paper. "Enter" is a more popular choice than "Return". According to Google ngrams. However it seems clear that Enter is a better bet than Return. I'd therefore write "Press Enter" unless I could be certain that the users have a specific keyboard with a specific label on the key want them to use. What is the target platform for your CLI application? This should guide your decision. Enter is more common on non-Apple keyboards. Return is the standard for Apple keyboards with 'enter', as you point out, sometimes written about the key. If you use a single word to describe the key, you should use the label used most often for your target platform. 'Enter' for Windows/Unix, 'Return' for OSX. 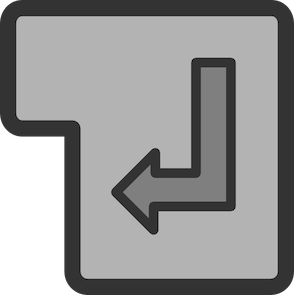 The 'Enter'/'Return' key, hereinafter referred to as the 'Return' key. ... or 'Enter', depending on your target platform. Return and Enter are different keys. Return often found as the main key, and Enter for the numeric key. Few software makes a difference between these. In Adobe Photoshop, Return will add a new line, and Enter will finish the editing. Microsoft Windows on screen keyboard uses Enter to describe both keys; but they still act as their corresponding key. Looking at several photos of keyboards for Windows, they often have the main key as ↵ Enter (the ↵ symbol stands for return), and just Enter for the numeric key. Apple Mac keyboard uses Return, with Enter written above to be accessed by the Fn key. Prefereably to use Enter for Windows and Return for Mac; as long as there's no difference between Return or Enter in your software. The Human Interface Guidelines (HIG) of the operating system of your program might give you a hint or the answer. There are HIG for Windows, macOS, Android and some more. For Linux things are a bit more complicated AFAIK. For Windows: https://msdn.microsoft.com/en-us/library/windows/desktop/dn742465.aspx Refers to "Enter" to submit the data. For macOS: https://developer.apple.com/macos/human-interface-guidelines/user-interaction/keyboard/ Refers to "Return" as standard behaviour of that key, and "Enter" as result of Shift+Return. No further specification of behaviour given. GNOME, XFCE (Linux, *nix): https://developer.gnome.org/hig/stable/keyboard-input.html.en Refers to "Return" to activate the focused UI button (= the opposite of Windows naming). As you see, things are not that clear and it depends on the target platform which name to use. Expanding slightly on Evil Closet Monkey's answer, the key on the right of Apple keyboards is unambiguously the return key. Some older Apple keyboards, and the current Apple Keyboard with Numeric Keypad, have a separate enter key. You can type enter using the combination fnreturn. Not the answer you're looking for? Browse other questions tagged keyboard documentation or ask your own question. Why F1 is the default help key?